Jeanette Crane with attorney Richard Hedgis listening to the prosecutor’s’s recommendation. 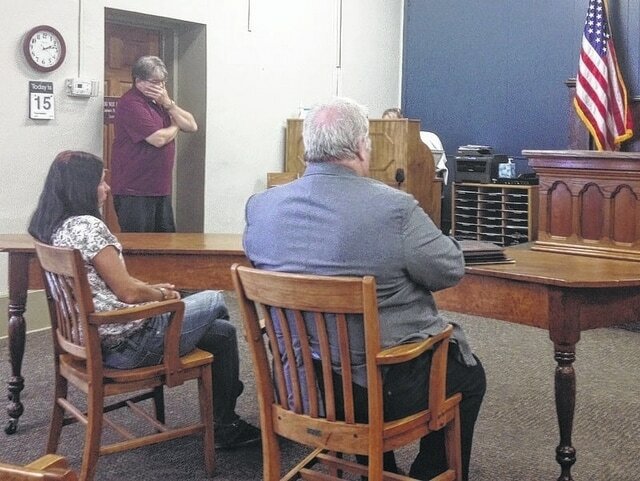 POMEROY — Jeanette Crane, who had previously entered a guilty plea to heroin possession and trafficking charges, was back in court Wednesday for sentencing. Crane had been in an intervention program while awaiting sentencing, but after a failed drug screen, the court decided to proceed. Assistant Meigs County Prosecutor Jeremy Fisher recommended long-term treatment for the 42-year-old Crane, saying prison control is not consistent with the goal of rehabilitation. Negotiations between the Fisher and Crane’s attorney Richarde Hedgis resulted in the recommendation that Crane go directly to Hannah’s House, a women’s recovery center. She must attend and complete her rehabilitation at Hannah’s House in order to avoid the 18-month prison sentence she was facing. Failure to successfully do so would result in a resentencing hearing. Crane will be on community control, assuming the terms of sentencing are met, for five years and was ordered to pay court costs. Presiding Judge I. Carson Crow asked if she had anything to say, and she said she did not.